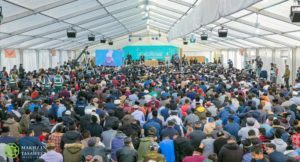 The event was held at the Baitul Futuh Mosque in London with an audience of more than 1000, including 700 dignitaries and guests from 30 countries, including Ministers, Ambassadors of State, Members of Parliament. 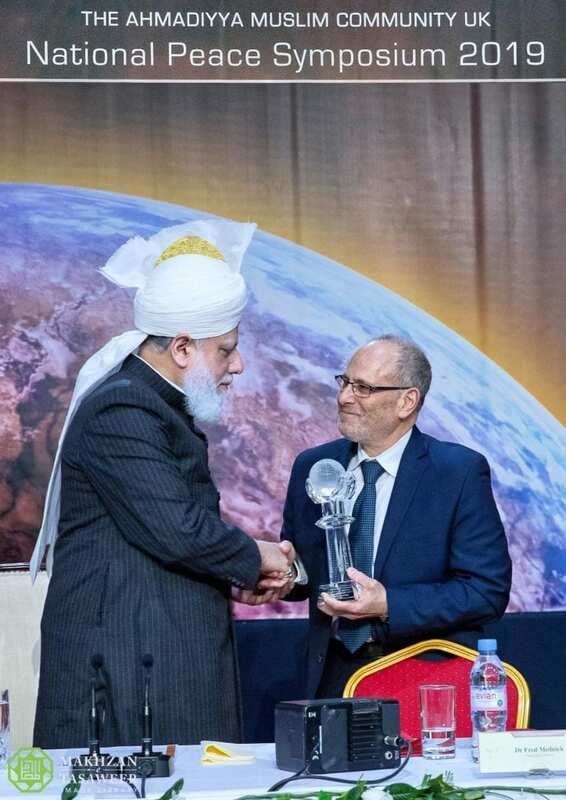 During the event, His Holiness presented Dr. Fred Mednick, founder of Teachers Without Borders, with the Ahmadiyya Muslim Prize for the Advancement of Peace in recognition of his efforts to provide unfettered access to education to some of the most neglected parts of the world. 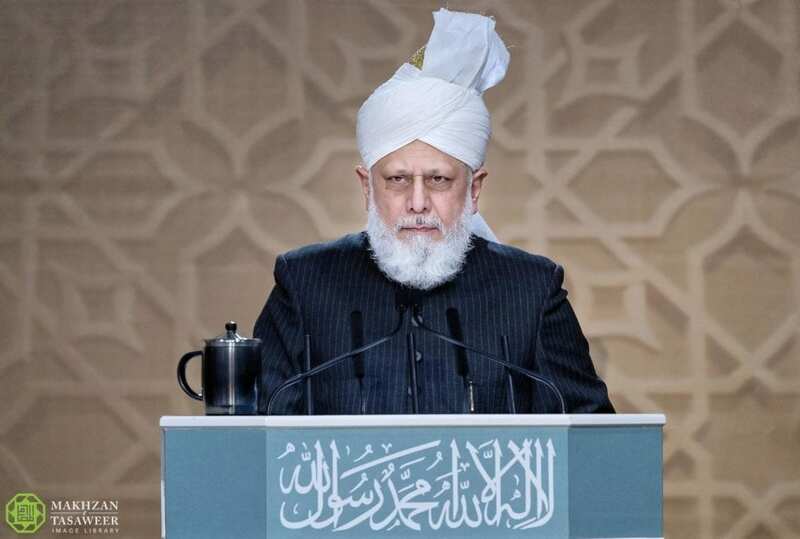 Hazrat Mirza Masroor Ahmad began his address by stating that the Ahmadiyya Muslim Community would never waver from its efforts to promote peace and justice in the world. His Holiness warned that rivalries between nations were intensifying and new battle lines were being drawn that could prove disastrous. His Holiness highlighted that nuclear war was no longer a remote or distant prospect, but rather a growing threat that could no longer be discounted or ignored. He mentioned a number of pressing catalysts including tensions between nuclear powers, conflicts and proxy wars in the Middle East, far-right nationalism, anti-immigration sentiments, economic frustrations and isolationism that continue to push nations towards nuclear war and global destruction. 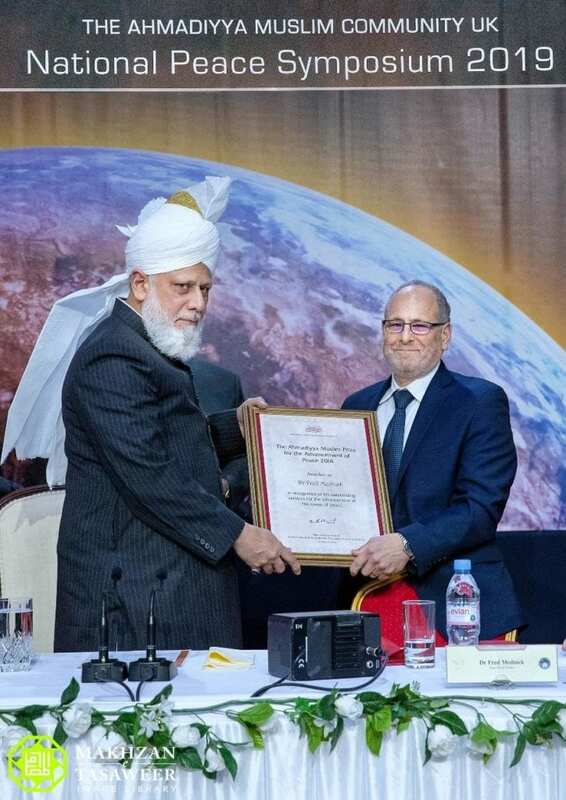 Hazrat Mirza Masroor Ahmad warned of the catastrophic nuclear destruction that could ensue if nations did not show tolerance or strive to break down the causes of division between them. His Holiness stated that nations are using conflicts in the Middle East as a tool to create dominance by building alliances and igniting further conflict. His Holiness cited Syria as an example of a war that had caused endless misery and remained in a precarious state. He mentioned that although these nations attempted to defeat extremist groups like Daesh in the Middle East, they have in reality, only allowed their hateful teachings to spread further. 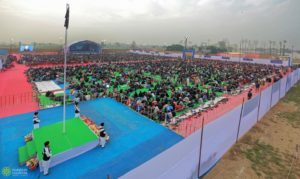 Hazrat Mirza Masroor Ahmad also emphasised that nationalism continues to rear its ugly head and that far-right parties are gaining popularity globally. He explained that a core reason underpinning far-right popularity has been widespread immigration. His Holiness further explained that feelings of resentment stem from the belief that existing indigenous citizens are being short-changed in order to fund and support immigrants. He provided both a long term and a short term solution to resolve this pressing issue. Furthermore, Hazrat Mirza Masroor Ahmad stated his belief to be, that the underlying cause of most resentment in society tends to be economic and financial frustration and that this inevitably leads to the spread of Islamophobia and xenophobia. His Holiness explained that the root cause of frustration and the resulting hostility, whether in the East or the West, is economic injustice and so it is essential that a concerted effort is made to bridge the economic divide amongst nations and their people. He stated that if such countries, that have been centres of war or division, are enabled to prosper economically, they will no longer harbour frustrations or bear hatred for other nations. Nor will their people be forced to migrate. 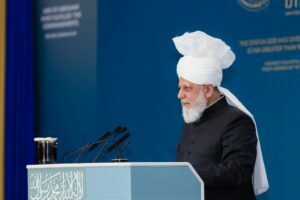 Hazrat Mirza Masroor Ahmad also addressed the widespread uncertainty and anxiety in the UK regarding Brexit and the UK’s future relationship with the European Union. His Holiness mentioned that he made his views on Brexit very clear during an address at the European Parliament in 2012, when he stated that the strength of Europe lies in its remaining united and together as one. Hazrat Mirza Masroor Ahmad concluded his address by praying for the long term peace of the world. Prior to the keynote address, a welcome address was delivered by Rafiq Hayat, the National President of the Ahmadiyya Muslim Community. Thereafter, the Most Reverend Kevin McDonald, Archbishop Emeritus of the Roman Catholic Archdiocese of Southwark thanked the Ahmadiyya Muslim Community for its strong resolve in promoting peace. Both before and after the proceedings, His Holiness met personally with various dignitaries and guests and held a press conference with journalists and members of the media. Khalifathul Masih addresses over 5,500 Muslim youths from across the UK.